"My painting practice is an escape from the world and at the same time is a way to know more about the world and my place in it. Painting and drawing are private acts of introspection, self-knowledge and spiritual transformation. It is a search for fulfillment and emptiness at the same time." Mirela Kulovic was born in Tuzla, Bosnia and Herzegovina and grew up in Croatia and Bosnia. After graduating with an Industrial Engineering degree at the top of her class, she felt a need for visual expression. Prior to taking classes at the SMFA, Tufts University, Kulovic studied painting and drawing at 'Sirena' and 'Art Club' studios in Croatia. 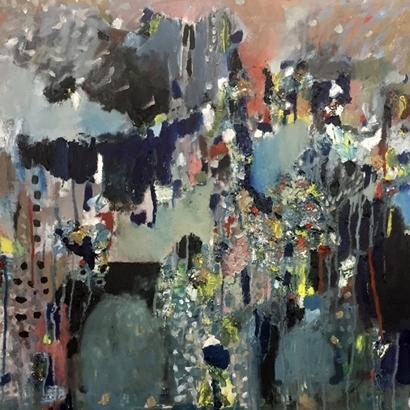 She has exhibited regionally with select solo shows at Bromfield Gallery, Cambridge Art Association, Inside-OUT Gallery and Brookline Arts Center and select group shows in Boston City Hall, Copley Society of Art, Cambridge Art Association, Brookline Arts Center and Gallery 263. Her work was published in Studio Visit Magazine Vol.38. Kulovic is represented by Bromfield Gallery in Boston. In 2017, she established the Art Center Gracanica in Bosnia and Herzegovina, a space for creativity and exhibition. She hopes to open its doors during the summer of 2018.